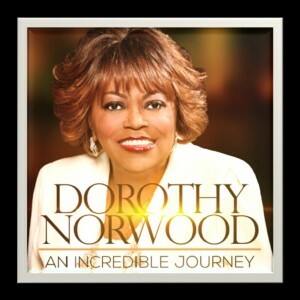 Dorothy Norwood Music Group has announced a distribution deal with EchoPark/JDI Entertainment and is readying the 52nd solo release of the world’s greatest story teller, Evangelist Dorothy Norwood in October. An Incredible Journey, produced by Norwood and Cedric Thompson features stellar performances from Dorinda Clark Cole, LeJuene Thompson, VaShawn Mitchell and Melvin Williams on the lead single, When the Church Begins to Pray. This entry was posted on Wednesday, July 23rd, 2014 at 1:40 pm	and is filed under Album Releases, Artist News and Updates. You can follow any responses to this entry through the RSS 2.0 feed. You can leave a response, or trackback from your own site.